In the 1st game we played Kilmacabea but lost at a score of 1-6 to 1-10. In the 2nd game of round robin we played Clann na Gael who we dominated for a lot of the game and beat them at a score of 1-12 to 7 points. In the 3rd game we played St. Oliver Plunkett's who dominated possession for the first half and continued to come out winners in the end by a score of 5-11 to 2-7. We played a total of nine matches managing to only win three and draw in one. This was played on a round robin system. In the first game we played Kilmacabea where we were beaten by a late goal in the sixth minute of injury time at a final score of 1-9 to 11 points. In the second game we played Kilbrittain and won convincingly in the end at a score of 2-8 to 6 points. However this was the end of our championship as Kilmacabea beat Kilbrittain in the third game an therefore being the team to progress to the next round. We won two out of three matches beating Castletownbere and Ilen Rovers, Gabriel Rangers failed to field against us. We played a total of six games and won four of our games beating Sam Maguires, Mayfield, Ilen Rovers and Carrigtohill. We failed to qualify for the final by one point. In the first round we got a walk over from Kilbrittain. In the semi-final we played Newcestown where we struggled against a physical side but eventually came out winners at a score of 2-7 to 1-6. In the final we met Carbery Rangers in Dunmanway on 15th October who were a physically stronger side. Carbery Rangers finished the game stronger to come out winners on a score of 2-10 to 9 points. We played a total of six games where we won three of them beating Bere Island, Muintir na Bhaire and St. Colums. In the first round we played Barryroe where we dominated the second half despite being reduced to 14 players to come out winners at a score of 10 points to 3. In the semi-final we played St. Colums where we dominated most of the match and won by a score of 1-15 to 3 points. In the final we played Kilmacabea in Union Hall on 27th November. It was a tight game with a number of scores going point for point but after won comfortably in the end at a score of 3-10 to 13 points. It was our first time winning the Junior C West Cork Championship. 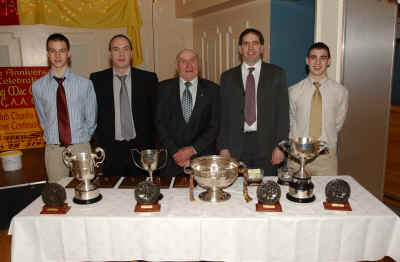 Three generations of O'Driscoll's at the Tadhg MacCarthaigh GAA Dinner Dance. 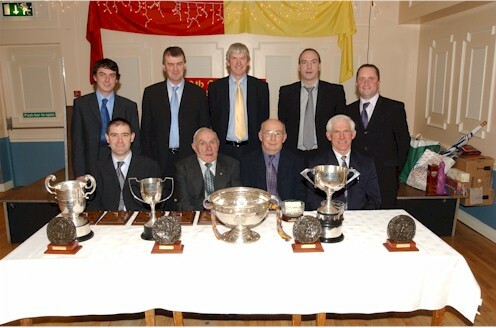 Current and past Officers of Tadhg MacCarthaigh GAA Club celebrating its 50th year at the Annual Dinner Dance. Back LtoR: Donal Leahy, Liam O'Driscoll, Liam Shiely, Gene O'Driscoll, Jimmy Keohane.